Signs of London’s history can be found everywhere. The city has also held onto its history in its many pubs and taverns. The Princess Louise – Although it isn’t by far one of the oldest pubs in London, The Princess Louise is full of Victorian charm. It is one of the few Victorian-era pubs in London that has maintained the glass barriers which, back in the day, segregated drinkers by social class into 12 sections around the bar. Constructed in 1872, it’s detailed interior has remained remarkably well preserved. Location: 208 High Holborn, WC1V 7EP. Nearest transport: Holborn underground station. The George Inn – Truly an historic drinking hole, The George Inn has been going for more than 300 years in Borough. According to the National Trust, the pub is the last surviving of the “galleried” inns and is one of two surviving coaching inns in Greater London. 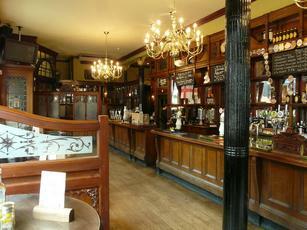 Charles Dickens was also known to have frequented it during its history as a coaching inn and coffee house. Location: The George Inn Yard, 77 Borough High Street, Southwark, SE1 1NH. Nearest transport: London Bridge Station. The Guinea – This is another one of the many haunts where Charles Dickens is said to have stopped for a drink and it has existed in its location in Mayfair since the 1400’s. The current building has been around since 1675. In addition to serving up a great pint, The Guinea is also known for its prime Scottish beef prepared over an open grill. Location: 30 Bruton Place, Mayfair, W1J 6NL. Nearest transport: Bond Street underground station. The Salisbury – Situated in the West End, the Salisbury is very much to this day a pub which actors frequent. Built in 1892 and rebuilt in 1898, the interior still maintains its original etched glass and hand-carved mahogany fixtures. After a respectful restoration in the early 1960s, the pub became a famous hotspot and has even been used in several feature films, including ‘The Boat That Rocked,’ starring Philip Seymour Hoffman. Location: 90 St. Martins Lane, Covent Garden, WC2N 4AP. Nearest transport: Leicester Square and Covent Garden underground stations. The Falcon– This truly unique pub is a Guinness Book of World Records holder for having the longest bar counter in the UK and was designed by MC Escher. This late 19th century pub features impressive wood paneling and detailed original glasswork which can still be seen to this day. Location: 2 St. Johns Hill, Battersea, SW11 1RU. Nearest transport: Clapham Junction station. Trafalgar Tavern – Built upon the site of a previous pub, the Trafalgar Tavern was built the year Queen Victoria ascended the throne in 1837. In Victorian London, the pub was at the center of its Naval and Maritime culture and is part of the Greenwich Maritime World Heritage Site. The pub also offers a stunning view of the Thames River and the City. Location: Trafalgar Tavern Road, Park Row, SE10 9NW. Nearest transport: Cutty Sark DLR and Greenwich Pier for Thames Clippers.